Organizers were getting a little nervous. 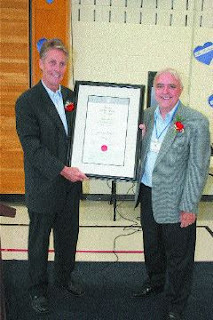 It was past 6 p.m. and they wanted to begin piping in the 25 nominees for 2007 Hamilton Municipal Senior of the Year at the awards dinner at the Sackville Hill Seniors Recreation Centre June 26, only George Foster had not shown up yet. Mr. Foster didn't know it, but he was the one selection committee had chosen as senior of the year. Mayor Fred Eisenberger was slated to make the official announcement prior to the dinner after all the nominees had been recognized. There was a noticeable sigh from some of the organizers when Mr. Foster arrived around 6:20 p.m. accompanied by his wife and one of two daughters. The long-time east Mountain resident wasn't late on purpose. He was doing the very thing that had earned him senior of the year honours in the first place. He was helping children. "The (Hamilton Children's Aid Society) called me and said they had an emergency, a child had to be taken to visit her father," said Mr. Foster, who has been a volunteer driver with CAS for the past five years. Without hesitation, Mr. Foster drove the child and made it back to the dinner only a few minutes after the nominees had been piped in. "Most of the things I do are for children," said the Stelco retiree, who figures he spends about 20 hours a week doing volunteer work. Mr. Foster was surprised to learn he had been named senior of the year. "It's a great honour," he said. A very active member of St. Michael's Anglican Church for the past 20 years, Mr. Foster has been responsible for recruiting and training readers, intercessors and eucharistic assistants. As a warden at the church he helps with the building's upkeep and the financial well-being of the parish. Mr. Foster has spent many hours as a volunteer with Sleeping Children Around the World, an organization founded by the late Murray Dryden (father of NHL goalie and MP Ken Dryden), that distributes sleeping kits (mattresses, clothing and school books) to poor children around the world. In January, Mr. Foster was among a team of volunteers that spent four weeks distributing 7,500 kits to children in Mumbai, India. Mr. Foster said he is planning to return to Haiti later this year as a member of Men for Mission International, a Christian organization that provides school supplies and other items to Haitian children and missionary workers. Last October, he helped install a roof on a school in Coup David. To get to the school the 67-year-old Mr. Foster rode several kilometres in the back of a pick-up truck and then hiked another 90 minutes through jungle and Mountains. For many years Mr. Foster helped organize the Walter Gretzky CNIB Celebrity Golf Tournament and he is the treasurer of the Sackville Hill Seniors Recreation Centre's Ukulele Band and often transports band members and equipment. "He's a very active gentleman who has committed so much to the community," said Carolyn Kovacs, one of the members of the Hamilton Municipal Senior of the Year Awards selection committee. "He's done work both in Hamilton and abroad and I think it epitomizes volunteers and the wonderful experiences that they can have and what they can contribute to the community." Ms. Kovacs said the 25 nominees is the most ever in the 13 year history of the award. Marilyn Hill and Bud Adams set up a Sleeping Children display at the Kitchener Waterloo Non Violence Festival on Saturday, June 16th. The festival designated SCAW as its official charity this year. We received donations totalling $238.25. The one thing Etobicoke resident Veronique Presswood will take away from her recent mission to help the children of Kenya sleep better is the grateful expressions on their young faces. "It's always the smiles of the kids - that's what gets you," she said of her two-week trip to Nairobi with Sleeping Children Around the World (SCAW). In March, Presswood, along with fellow Etobians Brenda Oliver and Duncan Macgregor, set out with three other volunteers to distribute 4,000 bed kits to the neediest children in the slums of Kenya's capital. The kits, consisting of a mattress, blanket, pillow, insecticide-treated mosquito net, light clothing, a towel and a few school supplies, left many of the children dumbfounded, Presswood said. "This was probably the first time many of the kids had ever received anything new," she said. "A lot of them don't ever get out of the slums and the conditions they live in are just deplorable ... there's no running water and the bathroom facilities are beyond belief." Since its founding in 1970 by Murray and Margaret Dryden - parents of legendary hockey stars Dave and Ken Dryden - the Canadian charity has delivered more than 869,000 bed kits to children in 32 different developing countries. The Kenya trip was Presswood's second such journey - last year she travelled to the Philippines. Like all SCAW volunteers, she paid all her own expenses on both trips - a policy that ensures every penny of the $30 donation is invested in a single child's bed kit. "Even then, you come home feeling like you got more than you gave," she said. Not only that, but all of the materials put into the kits are sourced and assembled by overseas partners in the country of distribution. In Kenya that partner was the Rotary Club of Nairobi, which not only assisted in the selection of the neediest children, but also arranged for all items to be made locally. "That way, the kits not only benefit the kids, but also put money into the local economy," Presswood said, adding that a donation towards a SCAW bed kit makes a nice way to honour a friend. "It's only $30 and it does so much." For every donation of a bed kit, donors receive a commemorative photo of the child who benefited from their generosity. Saturday June 9, 2007, 9:30 – 2:30 p.m.
SCAW volunteer Ted Swanston is raising money for SCAW and teaching people how to handle their money more wisely at the same time. He says: "While most people have some familiarity with investing, many do not have the time in their busy lives to develop their understanding in this important area. I have developed The Basics of Investing Seminar. It deals with concepts fundamental to investing (I will not be recommending specific stocks or mutual funds). I am not connected with any financial institution, nor will I derive any compensation related to the seminar. I just want to help raise awareness of Sleeping Children Around The World, and to share my investing knowledge." Power of Compounding, Different Types of Investments, Return and Risk, Benefits of Diversification, Ideas for Investing, and Q&A. Impact of Income Taxes and Inflation, Borrowing, Selecting a Financial Advisor, Financial Planning, More Ideas for Investing, and Q&A. Cost: Each participant is invited to donate $60.00 ($90.00 for a couple) to SCAW. Big-hearted Canadians directly donate $40 billion to charity every year, funding fights against disease, hunger, poverty and other causes in Canada and around the world. Our governments give another $90 billion — funding school boards, hospitals and other big institutions considered charities under the law. How do individual donors know which charity to support? On the surface, it's almost impossible to tell. Charities can claim on official statements that they are doing good works — even if they are not. The federal government's charity regulator has only 40 people trying to keep an eye on 82,000 charities. And every day, on average, another two charities are registered. When the federal Charities Directorate finds a charity is doing something wrong they can't tell the public. As part of the Star's ongoing investigation we've found many great charities. Among them: Habitat for Humanity Toronto, Camp Trillium, United Way Toronto, Sleeping Children around the World, and Foodpath in Mississauga. Each one is heavy on volunteers, strong on good works you can see in action, and completely open to scrutiny. Each of the five have jumped through hoops to show they are doing a great job. The Star investigated and found that they are. We went beyond their published financial statements to look at their operations, interview staff and other people and groups who had contact with them. Neil Hetherington, the executive director of Habitat for Humanity Toronto, runs a charity that has in the past five years built or is building 128 homes for people struggling financially. Habitat supports itself through an innovative "Restore" store that takes in building materials and resells them to the public. Their "grey power" volunteer team of retired professionals (lawyers, doctors, etc.) are often invited into a home renovation project to remove anything of value for resale in the restore. On Habitat's home building sites around the city, volunteers work with the prospective homeowner to construct a house, which the eventual owner pays for using an interest-free mortgage. Instead of giving people a charity handout, Hetherington said, "we are trying to break the cycle of poverty by giving access to capital." What's an example of a big fundraising campaign for Habitat? Last year, they bought 10,000 brown paper leaf bags (at 69 cents apiece), put their name and slogan on it, and volunteers with wagons distributed them around the city with the idea that even if the homeowner who got the bag did not make a cash or material donation, it was still great curb-side advertising for a day or two. This fall they are handing out 20,000. Habitat welcomes questions from donors. "We have a board policy that says any financial information is open to the public. You want to know how much a chair in our office costs? We will tell you," said Hetherington. His charity is very strict about how it presents information to the public. For example, all fundraising is fundraising (not recorded as public awareness as many charities do). Administration and fundraising is stated at 25 per cent of their expenditure annually, so 75 per cent of all expenditures are spent on good works. The Star finds that good charities spend at least 60 per cent of their budget on good works. This charity is over the top when it comes to delivering benefits and raising money on a shoestring budget. It's the charity founded by Murray Dryden, father of hockey goalie greats Ken and Dave. The latter, a retired principal, helps run the charity since his father died. At SCAW, they raise money to buy "bed kits" for children in developing countries. 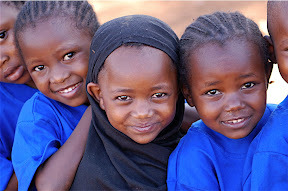 The kits differ depending on the country, but generally there is a comfortable mattress, a school uniform, raincoat, school supplies and perhaps a mosquito net. The charity spends absolutely no money on fundraising, because Murray insisted it all be word of mouth. Volunteers prepare the kits, volunteers travel on their own nickel (typically $4,000) to distribute the kits, and volunteers send out confirmation of donation photos to donors – all done from the Etobicoke home where Ken and Dave learned to stop shots in the backyard. Dave and his wife Sandra just returned from a distribution trip to the Philippines where they and other volunteers gave out 5,000 kits to smiling children and their families. SCAW gets about $1.6 million in donations a year and 100 per cent goes to the bedkit program because an endowment fund left by Murray Dryden pays the rent and small salary of SCAW's lone employee. "For the children and their families, and our volunteers, being involved with this charity is a priceless thing," said Dryden. Based in Peel Region is one of those great food banks that gets donated food from individuals and grocers and then uses volunteers to truck it around and hand it out from their warehouse near Dixie Rd. and Dundas St. East in Mississauga. Ten thousand people pass through the food bank each month, and Beju Lakhani, volunteer fundraising chief, said their two issues are keeping up with the demand and paying the bills for electricity, gas and rent. "We're doing okay but I would have to say we are always on the edge," said Lakhani. He's the director of sales and marketing for a software company but spends many hours each week as a Foodpath volunteer. Half the people benefiting from Foodpath are children and the charity also supports local breakfast programs. Foodpath is so volunteer-intensive that most of its annual $500,000 budget is spent on acquiring and distributing food to the needy. This is an innovative camp for children with cancer and their families. Their two campsites in Ontario, plus daycamps around the province, see 3,100 campers annually. About 80 per cent of Trillium's $3 million expenditure is spent directly on campers, with the remainder recorded as administration and fundraising. The theme is this: Children with cancer, and their families, need a break – if only for a week. The camps provide a typical summer camp experience but parents, siblings come along with the camper. They have 100 paid summer staff and 300 volunteers – many counsellors are cancer survivors who attended the camp. "Kids with cancer are still children," says Trillium development director Fiona Fisher. "They arrive at camp and they can be the first one up the climbing wall, they get to sing and play." The camps are funded by various community groups but among the most notable is an annual zero-cost Toronto-based event called Set Sail for Hope that brings the camp $155,000 each year. Toronto yacht owners, at their own expense, provide their boats and skipper the journey. Restaurants like Rodney's Oyster House, Fred's Not Here and chefs at the Westin Harbour Castle cook up a fabulous lunch on the Toronto Islands (at their own expense) and then the skippers take their guests on an afternoon cruise. Corporate sponsors pay about $7,000 each (some give additional donations). Arthur Boas, a skipper and volunteer, said they organize the whole event with eight, one-hour meetings. Cheques are written by corporate sponsors directly to Camp Trillium, a camp that Boas said runs on the ultimate shoe string budget. "These guys hammer bent nails back into shape so they don't have to buy new ones." Old and familiar, the United Way raises money to distribute to other charities. Yes, it's a big organization with significant fundraising and administration costs. But what put it on our list was the heavy use of volunteers to raise money through workplace and other campaigns. Their public statements show that in 2005, $83.3 million was dispersed to other charities, out of total expenditures of $100 million. That 83 per cent is a good number in the charity world. The remainder of the money is spent on:administration ($2.8 million); fundraising expenditures to support volunteer campaigns ($9.9 million); and charitable works the United Way itself carries out ($3.7 million). One of the best things the Star found about United Way was the volunteer-based committees of experts who rigorously investigate charities United Way supports. That's why giving money to a United Way supported agency is a good bet.